Portland's theatre history is marked by early enthusiasm and exceptionally vigorous growth. With the Pacific Northwest's often rainy weather, people sought refuge in movie entertainment, and the city eventually grew to have more theatre seats per capita than similar-sized cities in the United States. Beginning with short cinema segments at vaudeville houses downtown, Portland movie theatres came into their own swiftly and ambitiously. By 1915, there were over 70 individual theatres showing films both downtown and in neighborhoods throughout the city. By the 1920s, larger theatres were being built, including substantial neighborhood palaces such as the Bagdad, Hollywood, and Oriental. Meanwhile, downtown provided the Broadway, Portland, and Orpheum, to name a few. 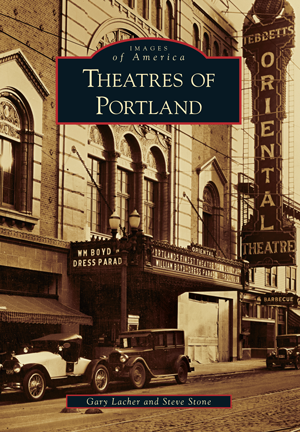 This volume contains an overview of Portland's theatre history through rare and newly discovered historical photographs of those memorable places of entertainment. Portlander Gary Lacher, a former television photojournalist, is active in researching and restoring films, having made numerous film donations to the American Film Institute and the Oregon Historical Society, which has provided many photographs for this book. Historian Steve Stone has researched and photographed Portland movie houses for over 40 years. Stone helps produce illustrated lectures for Portland's Architectural Heritage Center and worked in theatres for over 23 years.